In this series of blogposts, pro-choice people tell us why they are marching in order to encourage those who may be thinking about coming to their first March on September 26th. 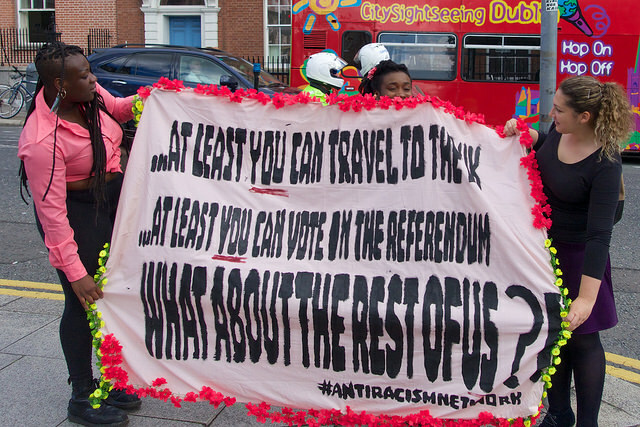 I’m marching because as a migrant non-citizen living in Ireland, I don’t have a vote. I don’t have the right to make my own decisions about my reproductive health. I don’t have the means to travel for an abortion. And I don’t have a vote. I’ve had an abortion, as have many, but personally I am not marching for the safe and legal abortion that I had. I’m marching for the abortion that I might need in the future. I’m marching for everyone who needs or wants an abortion and currently has no free, safe and/or legal means of getting one. So on election day, my vote won’t be counted. But on the 26th of September I will vote with each step that I take and each chant that I roar. And I’ll be joined by thousands in solidarity. Hopefully you’ll be marching beside me.